Is there anything better in this world than Good Bacon? Early settlers needed some way to preserve their meat, and drawing from both the Italians (think Prosciutto) and the Native Americans (who processed salt from seawater and taught them how to smoke meat), they started salt-curing then smoking their hams. As a side note here, we can trace Prosciutto back to China – “Jinhua Ham” is also salt-cured and was brought to Italy by Marco Polo in the 13th century. These hams quickly became America’s first quality export. Queen Victoria liked them so much she considered them a delicacy. In fact, she had a standing order of 6 Smithfield hams a WEEK! 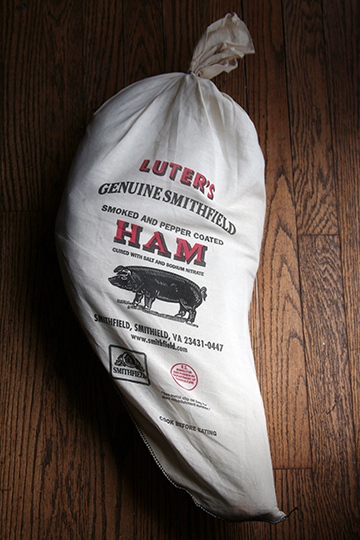 In 1926, the Virgina General Assembly passed a law dictating that “Genuine Smithfield hams [are those] cut from the carcasses of peanut-fed hogs, raised in the peanut-belt of the State of Virginia or the State of North Carolina, and which are cured, treated, smoked, and processed in the town of Smithfield, in the State of Virginia.” Hogs used to roam the peanut fields and forage for the nuts missed during harvesting. The law was amended in 1966 to enable grain-fed hogs to qualify. An interesting tidbit is that most of the hogs processed in Smithfield come from North Carolina.